Review: As a character and a superhero, Spider-Man has unquestionably enjoyed a lot of popularity ever since his first comic book came out. Indeed, it’s highly likely that many see him as one of their favourite superheros. Therefore it would surely seem to be an easy task to translate the friendly neighbourhood web crawler to the big screen to make a film that Spidey fans across the world can enjoy, but that is a task that has posed its challenges for Hollywood. One trilogy of his big screen adventures had two gems but then squandered it all with a messy third chapter. A reboot then followed, which produced two more pretty lacklustre outings, and consequently poor Spidey got a third reboot, which this time has thankfully got the character back on course. Of course, this third reboot only came about after Sony and Marvel struck a deal which enabled Spidey to crop up in the MCU. His MCU foray began with a tremendous turn in last year’s Civil War, and now with both Sony and Marvel’s input, the webhead has a new adventure. As Peter battles with the mundane school life, he yearns for something more and despite his tutelage from Tony Stark, Stark does not believe Peter to be ready. 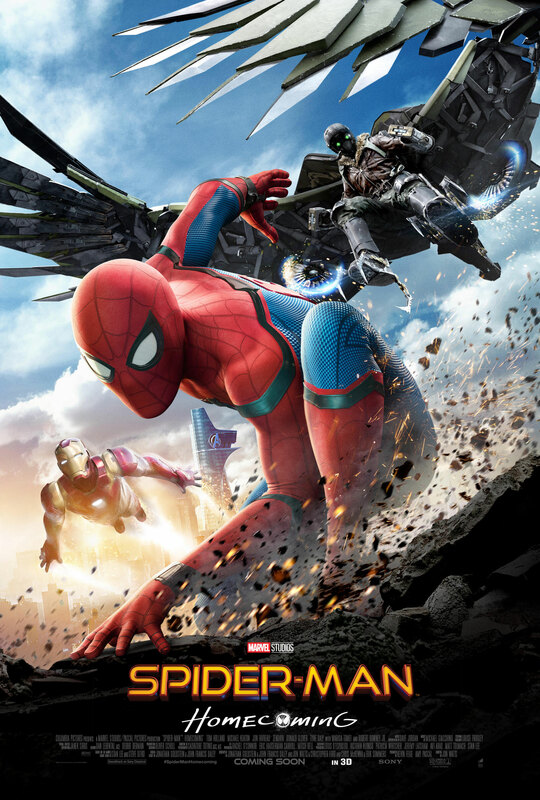 All the while, a new threat is emerging in the shape of the Vulture, a man whose plans turn nasty after seeing something slip out of his hands, and of course he clashes with Peter. Tom Holland remains excellent as both Peter and Spider-Man, carrying on from his sublime turn in Civil War. The previous films really didn’t for the most part capture Peter as a high school kid, and all of the problems that high school kids go through. Though it is kind of ironic for Keaton starring as a bird-esque villain given his Oscar nominated performance a few years ago in Birdman, he is by far one of the most refreshing villains the MCU has seen, given that the MCU has had some well documented problems in terms of nailing down a villain to match the calibre of say Loki. His character is fleshed out and though he’s not taking the title of the best MCU villain, he’s not the sort of disposable bad-guy that past MCU flicks have given us. After directing 2015’s Cop Car, Jon Watts calls the shots here, and while some of the action scenes that he helms here are certainly very enjoyable to watch at times, there are moments where it does falter a little bit. It’s not exactly weaving any new webs but it does manage to be for the most part a lot of fun to watch. However, you never come close to feeling the anxiety or the tension of the situation in the ways that Raimi’s first two films in particular pulled off so spectacularly. The rest of the cast do a fine job and as you might expect RDJ is there to provide a considerable proportion of the laughs, a role he shares with Peter’s best mate in high school Ned (Jacob Batalon). Concerns that Iron Man’s appearance would be overbearing are thankfully wide of the mark, as he is used sparingly, but when he has screen time, it’s used to great effect. After the lull that was the Amazing Spider-Man films, to see Spidey back on track will undoubtedly be pleasing to long time fans of the character be back in a really entertaining film that really explores his high school years in ways that perhaps hasn’t been seen before. Yet at the same time, offering nothing really new and or innovative in terms of what has come before it, both in terms of the Marvel Cinematic Universe, and indeed, previous Spider-Man movies. A familiar premise and characters, but with a refreshingly interesting villain and some well filmed action scenes, but at the same time, not breaking any new ground.